Do you know the Verizon commercial where a guy is sitting at a table with a bunch of kids and he asks them questions? You never know what the kids are going to say and sometimes their answers just make you say, "huh!?" Sometimes I feel like that guy. The one who is interviewing the kids; only I am sitting with my Lunch Bunch kids. I never know what they are going to say or come up with. s wanted to remind other students of important messages. 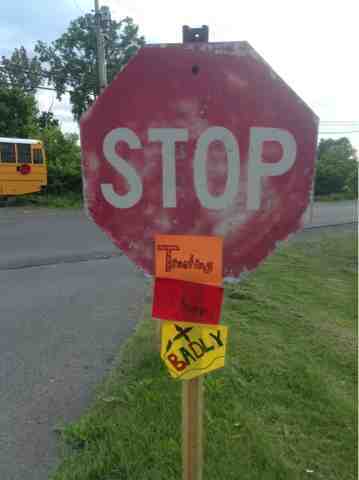 At that time we left 2 STOP Sign messages for everyone to see. Recently, however, they decided that they wanted to leave a few more messages and "borrow" a few more STOP signs on campus. I really can't tell you if our messages are making a difference. I do know that after I stayed late one day to hang the signs and surprise the kids, the next morning the groups ran up to me letting me know that they saw them on their bus rides to school. What I have learned this year is that no matter how small you are you can be a thrower of starfish.